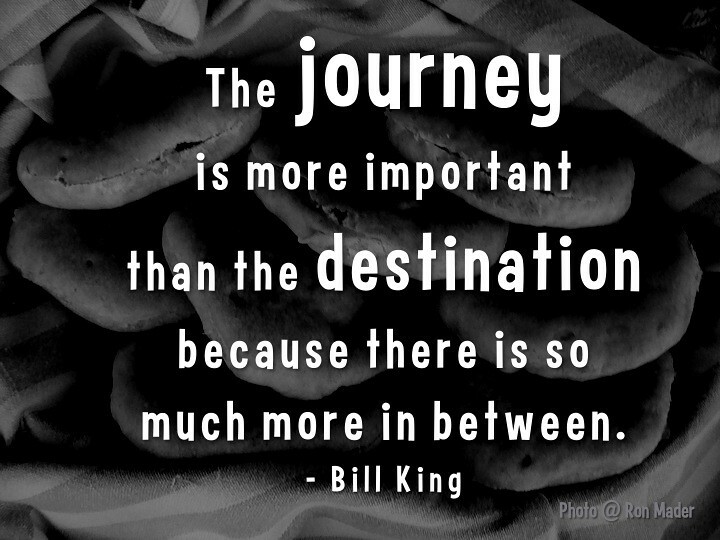 As I wrap up this semester, and my major project for EC&I 832, the quote “the journey is more important than the destination” comes to mind. When starting this project, I remember emailing Alec (sorry!!) multiple times to clarify if I was “on the right track.” I was so concerned with what my final “product” would be. He told me to focus less on that, but rather the process of it, and of course, he was right! I started off with a more jaded view of Digital Health & Wellness. Technology addiction, narcissism, distraction, depression, anxiety, the need for instant gratification… how are students ever going to navigate the digital world with all these ever increasing issues and problems working against them? The more the semester went on though, and the more I began to reflect on my own social media use, the more I started to think about all the power for good it has, and how that outweighs the negatives — if we’re taking the time to educate and teach proper use, etiquette and digital health in schools. (Plus the other elements of Digital Citizenship from Ribble!) Two terrible tradegys which have occured recently with a school shooting in Florida and the Humboldt broncos bus crash, have further solidified my faith in humanity and the positive power of social media. #marchforourlives and #humboldtstrong continue to amaze and inspire me everyday. This mindset change has been an important part of my journey, and continues to impact how I talk to students, colleagues, friends and family about positive, and ultimately healthy social media use each day. As I spoke about in my Summary of Learning for the class, so much of what I did this semester, was viewed through a Digital Health and Wellness lens. Everything I was reading, tweeting, and thinking about came back to digital health. My own personal use of technology and social media has been affected, as I have learned so much along the way of how I can better balance and manage my time online. Check out a few of my favorite reads on that here, here, and here. All of these offer great ideas, and tips to better take charge of your digital health. Turning off push notifications for Facebook and Instagram. Not having my phone light up with memes I’m getting tagged in (I seriously love memes, please keep tagging me in all dog memes), or comments or likes, really helps me feel less inclined to always be checking my phone and seeing if there is anything new. When I have time and choose to open Facebook or Instagram, I am either surprised, or not affected at all by any notifications. I so far have kept Twitter push notifications on, but I am getting close to turning them off. I get way too many “in case you missed so and so’s tweet, or have you seen..” and this is not at all what I want pushed to my phone. Unless I figure out how to turn off these specific random notifications that I don’t care about, push notifications for Twitter will also go off. I am not popular enough to turn off push notifications for Snapchat. If I get one Snapchat every week it is pretty exciting, so I’ll keep that excitement notification for now. No (or less) phone before bed. Yes, I use my phone as an alarm and charge it in my room… despite all the suggestions. I have made a conscious effort to read a book before bed. Not having screen time right before bed is something I am working really hard on. I find myself relentlessly scrolling for hours in bed, especially if I can’t fall asleep. I found myself doing a lot of tweeting at this time, but have tried to set some time aside to scroll Twitter earlier in the day when I am more alert and energized. There is too much good stuff on there! By reading an actual, paper book, I find I can get to sleep faster, and I also don’t waste hours of precious sleep time because I am creeping on 2 years worth of someone’s Instagram pics. I also love reading for enjoyment – rather than just scholarly articles, so this has been a great activity for me. Being more genuine and purposeful with my interactions. These come from the second article I mentioned above – seriously read it. I am trying to be very aware with what exactly I am doing online at a particular time – and if it is just mindlessly scrolling, there needs to be a max time I’m willing to spend on that. I also want to be the same person I am on social media as I am in “real life”. Yes I look best in photos of my good side with the Valencia filter, but what I am sharing should enhance my experience and my connection with others, not take away from it. I want to be the same caring friend out for coffee as I want to be commenting “Congratulations” on your exciting Facebook post. Being less caught up in showing my “perfect” life vs. my actual life has been a tricky mindset change, but one that is important. Being aware of my time online. Checking the battery usage setting on my iPhone that I shared with my students in my presentation, is a game changer. Why yes, I have spent way too much time on Instagram today. 5. Listening to myself. If social media is making me feel negatively about myself because all I see is friends posting engagement pics (#foreveralone), or the Kardashians baby drama infiltrates every inch of what I’m seeing, or Trump’s just being Trump, then I may need to take a break. It doesn’t always need to be as drastic as completely denting the apps for a long time period, but it’s okay to go have a bath and leave your phone downstairs. Or to ask your friends to text you because you won’t be checking the Facebook group chat for a while. Self-care is huge, and I need to take care of myself digitally sometimes. For quick reference, here are a list of the blogs and some of the learning I explored this semester regarding digital health & wellness. –My first post outlining how I thought my project would go. –Reflecting on my own social media use – not quitting for the wrong reasons, but staying for the right ones. –When my mindset began to shift to a more positive outlook on digital health, and how we need to help kids achieve a healthy digital life through use in school. I have genuinely learned so much this semester through our course content and my own journey through my project. Thanks for a great semester Alec and EC&I 832 classmates! I look forward to EC&I 830 starting up in a few weeks! On March 28, 2018, F.W. Johnson Collegiate hosted their annual Wellness Day. Wellness Day is put on for all grade 10 students, and brings together various speakers, organizations, and agencies surrounding positive wellness. Students have a choice of different sessions to attend throughout their morning, culminating in a final keynote speaker for the entire group to end the day. Pet therapy, art therapy, Planned Parenthood, The Schizophrenia Society, the SGI Safety Squad, Cyberbullying, nutrition, fitness, body image, Canadian Mental Health Association, plus more were some of the options for sessions and presenters our students could choose from. This year, I asked the organizing committee – the Bachelor of Science in Nursing 4th year practicum students and a teacher in our building, if I could present on Digital Wellness. As I am not currently teaching Wellness 10 right now, I thought this would be a great way to share with students what I have learned this semester in EC&I 832 and for my major project. I ended up with two sessions of about 20 students each which I thought was fantastic! I wasn’t sure if students would sign up for it, or be drawn by some of the other “cooler” sessions. When I was planning my presentation, I knew I wanted to make room for a lot of discussion with students and for their input, and I also wanted to focus on how we can positively improve our digital health, rather than just talk about all the ways technology and social media is harming young people much like them today. I am sure they hear it enough from parents – and from other teachers – how they are too addicted to their phones and can’t function without them. I am not going to share my entire slideshow I used to guide my presentation, as I left a lot of the slides blank with just a question I posed, and then we discussed. Students were very engaged and willing to answer my questions as well as chat together. We started off by talking about how technology had changed over the years – much like Alec did in our first EC&I 832 class. I had them guess what technology was being talked about in a negative manner – they had no clue what a “walk-man” was! We then got into the social media they use, and why it is great, because it really is great in a lot of ways! Snapchat and Instagram were the most used – apparently Facebook is “old news” and Twitter is only for old people. Snapchat and Instagram gave them a way to connect with friends, and share what they are doing. We also discussed potential problems they saw with this technology. Cyberbullying, body image issues, addiction, distracted in school, all came up as issues. We also talked about what physical and psychological effects technology and social media can have. Negatively affecting sleep, feeling depressed, feeling anxious, being obsessed with the perfect filter, always comparing yourself to others, and eye problems were all effects they identified easily. I tried to make the presentation as fun as possible – and brought it back to myself as much as I could. I thought it was important for them to realize social media and technology addiction isn’t just a teenager thing, and that the more adults open up and discuss, can help students do the same. These are a few of the slides I used to talk about issues like “self-itis” and no mobile phone phobia or nomophobia. Thanks to my classmate Amy for sharing about nomophobia and her project, which inspired me to incorporate it in mine! Students did a nomophobia questionnaire from a study, to also see where they stacked up in terms of being without their phone. This generated a lot of great discussion about how we feel when we don’t have our phones. Body image issues, FOMO (fear of missing out) and distraction were also topics I touched on. I also had students reflect on their own social media use, using this activity from Common Sense Media. In this, I also shared my own reflection of my social media use. The last bit of my presentation (I was feeling rushed — to much to talk about!! ), focused on ways we can combat issues with technology and social media negatively affecting us or becoming addicted. One of the first things is to think about how much time we are spending on our phone – and what exactly that time is spent doing. On iPhones there is a setting you can check to see how much of your battery is going to what. This was a new learning for many students (and myself!). We spent some time checking and being amazed how many hours they were spending on apps. Hours and hours on Snapchat, seriously. Choosing who to follow, or unfollowing for that matter, turning off push notifications, restricting times on phone (not at meal times, driving, etc), being genuine and making connections with those around you were all things we discussed. Many of them had friends on Snapchat or Instagram that they liked things of, but didn’t actually ever talk to them at school if they were to see them. Taking a break, deleting apps for a time period or moving apps off your home screen were more ideas. Sleeping also was a hot topic – reading before bed, charging your phone in a different room, and no screen time an hour before bed were also ideas students thought of. I wanted to give students a chance to do my survey, but unfortunately, we just ran out of time!! (In both sessions). We ended talking about a small goal we could set for ourselves to improve our digital health. Overall, I am very happy with how things went, and loved sharing what I learned with students and that we were able to engage in genuine discussion regarding this very relevant issue to their overall wellness. One of the tasks I wanted to accomplish with my major project was creating a survey on Digital Health & Wellness to put out to my EC&I 832 classmates, twitter followers and students. View the survey here, and my blog post on how I chose what to ask here. I am not going to lie, I am disappointed with the response I got. I only ended up getting 27 responses, almost all of which were adults between 20-50. I had originally planned to make the survey part of my presentation for Wellness day for my students, however, we ran out of time in both of my sessions due to great discussion, which I was totally okay with! In reflecting, I could have made my survey a bit shorter, as that may have been a deterrent for those completing it. Although the data is not from a substantial sample, so please keep that in mind, I would like to share some of the findings. First off here is the ages of my respondents. I was surprised first of all that only 67% of respondents used Facebook. I thought more would have Facebook. The next thing that surprised me was how many people look at their phone when they first wake up and when they go to bed. I thought I was one of the only crazy ones!! In terms of screen time affecting sleep, 1 was not at all, to 5 which was most definitely. Again, with all the information circulating about blue light and screen time affecting sleep, it seems that most people weren’t overly concerned with their screen time affecting their sleep. Related to sleeping, 78% use their phone as an alarm clock, so it is not surprising that many keep their phone beside their bed when they sleep. Charging your phone in another room at night, is a popular tip I have seen come up in many places throughout my journey on this topic. Hard to charge your phone in another room when it is your alarm clock…. myself included in this problem! Another question I asked related to some ways we can hope to achieve more technology balance related to push notifications. I was happy to see that a good chunk of people are not allowing push notifications on all their apps. Turning off push notifications for Instagram and Facebook have been awesome for myself personally. Again, with 1 being not at all, and 5 being most definitely. Many respondents are feeling distracted by their phones and social media. Not surprising.One of the open ended questions I asked was regarding content on social media that made respondents feeling positively, and subsequently, negatively about themselves. I really enjoyed reading the positives people get from social media – many of which I feel the same about. It is also important to to consider the things that made people feel negative about themselves. Is there a way to actually have social media without these things? I asked a question relating to deleting posts if you didn’t get enough likes, which was definitely more catered to students. I was happy to see this didn’t seem like a stress for adults, but I do worry about the pressure to get likes that young people on social media feel. I also asked questions on how social media affects stress and anxiety level, and both had quite low level responses. Again, a happy surprise, but I am not so sure this would be the same for the younger generation I currently teach. Not a surprise to me again, was the number of people who have experienced cyber-bullying online. I only fear this number would be higher with students again. Another idea I have explored throughout this semester towards better digital health is taking a technology break. 59% of my respondents have taken a break, this is also higher than I would have thought. This seemed to be effective for most that answered. I also asked about overall digital wellness, with 1 being very unwell, to 5 being very well. Again, I was very pleasantly surprised how well respondents felt they were. I again wonder and worry about our young people. Although respondents feel quite digitally well, at the same time, they do feel moderately addicted to their social media though. Interesting! Lastly, I asked what issues (they could click as many as they wanted) related to digital health were most concerning for themselves personally, as well as society as a whole. The charts are hard to read, so just to summarize the top responses. Personal concerns – Digital distraction (59%), technology addiction (48%), feelings of depression/increased anxiety/stress (33%) and need for instant gratification (26%) were the top answers. Societal concerns – Technology addiction (78%), cyber bullying (74%), digital distraction (74%), need for instant gratification (70%), narcissistic behaviors (56%), loss of social skills (52%) and feelings of depression/increased anxiety/stress (48%). Again, I wish I could have got responses from more people and younger aged students, but I feel very positive about the digital health of my respondents! Very early this semester we were introduced to Ribble’s 9 Elements of Digital Citizenship as we began to ponder our major projects and what avenue we might explore to best guide a large part of our personal learning over the next four months. I was immediately drawn to one element in particular – Digital Health & Wellness and after a lot of deliberation, I was able to somewhat coherently outline what exactly I was hoping to accomplish in my first blog post back. Since then, I have spent a lot of time reading, and sharing articles on Twitter having to do with all things related to Digital Health & Wellness. I have tried to use #digitalwellness, and I am actually starting to see more and more things come up, so I am hoping this trend can continue! I have also tried to view all of our learning so far in class sessions as well as through reading others blogs and following #digcit and #eci832, through a lens of digital wellness, and trying to always connect back. I am still mostly on the same track with the things I originally outlined that I wanted to complete for my major project. A closer look at my own digital health and wellness. I don’t feel I lead a balanced lifestyle with digital technology. What would balance look like and how do I find it? I wrote one blog post so far about my own issues revolving quitting social media, and I plan to continue to write and reflect on this.What example am I setting as a teacher – and are we setting as adults and parents for our students? I also realize that my project and this specific portion relates to digital etiquette, which is another of Ribble’s elements and I begin to look at this area later in this post. Survey/collect information on digital health and wellness from ECI&I 832 classmates, Twitter followers, and students. Is our technology affecting how we sleep? How we view our bodies? Do we feel “addicted” to our technology? Addicted to social media? I haven’t got here yet, but I still plan to do this! A variety of online resources centered around teaching students about digital citizenship, specifically digital health and wellness such as Common Sense Education, and use these resources as a starting point to curate my own. I have been exploring and saving galore! Develop a presentation/session on digital health and wellness for F. W. Johnson‘s Wellness Day in March which is a day dedicated to Grade 10 students and positively impacting and improving their overall well-being. I haven’t developed my presentation yet but am mulling over ideas. I want it to be based on building healthy social media and tech habits, vs. “scare” tactics on how their mental health is at risk. I am scheduled in for two presentation time slots! I just need to come up with a creative title for my session so kids want to sign up… any thoughts? The one area I feel like I have shifted on in my major project is moving towards positive digital health, vs. highlighting all the ways our digital health is being affected negatively. I feel like I started off pretty strong with a mindset that we need to drastically improve our digital health, and that our students are experiencing difficulties in many areas of their lives because they are not digitally well. Not to say that I don’t believe this anymore–because I definitely do think many of us are not digitally well, but I do think there is a lot of hope…perhaps you could call it a “cure” for the sickness we are currently faced with. I could give you, or quite easily you could find for yourself, a long list of articles stating the dire circumstances of our kids’ mental health currently (and trust me, I see this everyday in schools and it worries me as I wrote about last week), and how the rising rates of depression, anxiety, and self-image issues are explicitly linked to the rising rates of smartphones, social media, and technology in the hands of our youth. But instead of just scaring ourselves – like our parents, grandparents, and great-grandparents were scared of the the radio, the television and video games – and blaming this actually very new in the grand scheme of things technology – why are we not doing more to learn with our kids about it? This leads me into the realization that although my project focuses on digital health and wellness, it also relates to one of the other 9 elements which is digital etiquette . “We recognize inappropriate behavior when we see it, but before people use technology they do not learn digital etiquette (i.e., appropriate conduct). Many people feel uncomfortable talking to others about their digital etiquette. Often rules and regulations are created or the technology is simply banned to stop inappropriate use. It is not enough to create rules and policy, we must teach everyone to become responsible digital citizens in this new society.” (Ribble, 2017). I believe digital etiquette is really one of the first areas we need to start teaching, modeling, and talking about in our schools and classrooms, and ultimately this will connect us to digital well-being. Banning cellphones seems to be the direction where fed up teachers and schools are heading, trying to engage students in learning, and disengage them from their phones. The Toronto Principal in the above article who just banned cellphones states the reason being “to minimize distractions in the classroom and reduce the inappropriate uses of the devices during the school day.” The grade 7 and 8 students can use them at lunch but there are ridiculous (in my mind) restrictions. “…the rules will be: no social media, no texting, no taking or viewing photos and videos.” So…. playing candy crush is cool, but basically you cannot use your device for any of the other ways it is able to communicate with the world around you. I have so many problems with this. Banning cellphones, is something I completely disagree with. Many teachers express their frustration with kids not being able to focus on the lesson, or getting their work done because they are so focused on their cellphone. Whether it is keeping up a snap-streak, chatting on Facebook messenger, or scrolling vines, they are evidently disengaged from class, and locked into that device in their hand. There are a few issues at hand here that connect to digital etiquette. Obviously, conversations need to be had between teachers and students about who/what/when/where/why they can be on their cellphones during those 60 minutes of class (and no, the answer shouldn’t be never). If we just starting taking kids phones away without setting clear guidelines, we shouldn’t be surprised if they get upset at us for doing so. My refusal to take away a phone stems from the fact that that is a $500-$1000 (or even more) device that I have no business or desire to be responsible for. I don’t want it falling off my desk and having a screen shatter, or seeing anything (inadvertently or not) pop up on their screen that isn’t meant for my eyes. I would much rather ask a student to put their phone away in their pocket, or binder, if I am really concerned with their inappropriate usage of it at the time. If my phone cannot be out at all in a meeting, or in a graduate class, I would expect the person in charge to tell me that. I am a responsible adult (okay sometimes), and I feel like I possess proper digital etiquette skills that I know I could check my phone, reply to a message or email, or even take an important call during a meeting or class in a respectful manner, at an appropriate time. Teachers do this in staff meetings, heck teachers do this during the classes they are teaching. Because sometimes you need to reply or answer that call, and that is acceptable. We need to allow our kids to do the same. Students will ultimately struggle with judgement and being able to know what needs to be replied to, versus what doesn’t need to be replied to at that very moment. Can they wait until you are done your lecture (please reflect on the amount of time you’re lecturing if you are…), or until you are done an activity, or until you are done having a class discussion? Yes, it most likely can. But if they don’t begin to practice this appropriate use, how do we expect them to master it? We all know mastery of a skill (or a behavior) doesn’t happen without opportunities to try and try again, and we can expect students to start at a low level of acquisition, and with our help and guidance perhaps move to progressing, to meeting, to hopefully exceeding our expectations! We need to give them this chance. We as teachers can not only talk about appropriate use and set out guidelines in our classrooms, but we can model it as well. My cellphone is either in my pocket, or on my desk at all times. I don’t lock it away – I’m not scared of it being stolen, nor am I uncomfortable with students seeing me check my phone, and *gasp* reply to a message or email. No, I am not going to do this mid-math example or during a workout in Phys.Ed, but I am going to do it at an appropriate time. And students need to see this, if they have any hope of beginning to understand appropriate use as we ween them off the idea and current reality of checking it every 5 seconds. Someone in class (sorry I can’t remember!) had mentioned teachers in their building modelling digital etiquette and for example not walking down the hallways looking only at their phone, as many of our kids are. This is such a simple suggestion, but I think can totally be effective and is important for teachers to be aware of in creating a climate of appropriate use. It reminded me of this PSA that Luke had shared on Twitter a few weeks ago. I know I am guilty of walking inside and outside of school at my phone, and could easily be one of these people in the video! I think this video appeals to kids with humor, but it also sends a serious message about the dangers of being glued to our phones not only when we are walking, but especially when we are driving. Texting and driving, Snapchatting and driving (seriously it’s crazy), scrolling Instragram and driving, really anything that has you looking at your phone screen is a huge distraction and relevant issues for not only all drivers, but especially today’s teens learning to drive. I remember my parents being very worried about my music being too loud to distract me, and when I got my license was also when they introduced the only “one friend” in the vehicle rule for new drivers in Saskatchewan. With all the distractions that can take place on the one little device that we probably don’t want to send our kids on the road without (in case of an emergency), it doesn’t matter how many people or how loud the music, the danger is right in their hands. We have 5-6 hours a day with our students, and instead of treating that time as time that needs to be spent away from their phones, maybe we need to shift our mindset to time spent with their phones. No, not 6 hours on being glued to their phone screen, but 6 hours that we can help them begin to learn and understand appropriate use and etiquette. Cellphones, social media, and instant communication is here to stay, and it is only going to become more prevalent, more normal, and more engrained in the fabric of our students lives. We need to work towards helping them achieve mastery of appropriate use, just as we want them to achieve mastery of every other skill we teach. I had a really hard time deciding what I actually wanted to do for my major project in EC&I 832. I am very connected–probably too connected (hint: more to come on this), to my phone, computer, and all the social media, apps & digital tools that I have come to know and love. Snapchat, Facebook, Instagram, MyFitnessPal, Fitbit, Kahoot, Plickers, and Google Classroom, are all apps that I use almost every day in different aspects to interact with either friends, family, colleagues, students or the social world around me. I didn’t feel that exploring apps – whether for personal or educational use was the right path for me to truly engage with the content in this course, self-reflection, and the overall learning journey through digital citizenship. It was upon reading Ribble’s 9 Elements of Digital Citizenship, and reflecting on my own behavior and knowledge in these areas of my own life online, that I really began thinking about Digital Health and Wellness. Digital Health and Wellness is the 8th element in Saskatchewan’s Digital Citizenship Policy Planning Guide, which includes both physical and psychological health concerns/issues related to digital technology use. As a Phys. Ed/Health 9, and Wellness 10 teacher, I see so many connections to the Dimensions of Wellness (what and how many dimensions there are varies by source). Physical, Psychological, Social and Spiritual Wellness are all important contributors to one’s overall health, and well-being. Digital health has clear impacts on all areas – from physical concerns like ergonomics, to psychological concerns like internet or social media addiction. As we continue to spend so much of our time and build more aspects of our lives online, maybe Digital Wellness should be an entire dimension of it’s own? In looking at Saskatchewan’s Digital Citizenship Continuum for Digital Health and Wellness below, I am intrigued as a high school teacher by what Grade 10-12 students should understand and do. For my project, I would like to focus on how I can help students learn, understand, and implement these key ideas. I am especially interested in helping students (and myself…) live a balanced lifestyle with their technology and digital tools that are at their fingertips 24/7. A closer look at my own digital health and wellness. I don’t feel I lead a balanced lifestyle with digital technology. What would balance look like and how do I find it? What example am I setting as a teacher – and are we setting as adults and parents for our students? A variety of online resources centered around teaching students about digital citizenship, specifically digital health and wellness such as Common Sense Education, and use these resources as a starting point to curate my own. Develop a presentation/session on digital health and wellness for F. W. Johnson‘s Wellness Day in March which is a day dedicated to Grade 10 students and positively impacting and improving their overall well-being. I am looking forward to the learning journey I am about to embark on, and I would love any feedback, ideas, or resources that any readers feel would enhance my project!